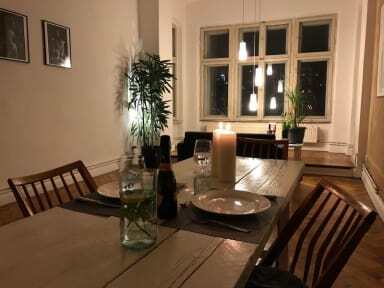 A sharing atmosphere: A big living room with eating area and a kitchen you are free to use to cook yourself breakfast or meal. Experience the original Berliner lifestyle in the cool area of Prenzlauerberg. My partner and I had a fantastic stay at Vanni’s house recently for 5 nights. great location, really well connected to public transport. Lovely apartment, spacious and clean rooms. Vanni went above and beyond to give us any help or advice we needed, super friendly and very accommodating. Would 100% stay again when next in Berlin and would recommend it to anyone. The host was very friendly and helpful. The room we stayed in was spacious and cozy, we felt like home. Bed mattresses were perfect for a really deep night sleep. All the decorations and furniture gave great vibes. Got to say it‘s a place to remember and to come back. Vanni is a wonderful host and was friendly, accommodating, and extremely helpful. We had a fantastic stay in this beautiful, stylish apartment. The location is well connected to the various districts of the city by public transport and is easy to get to from the airport. The apartment is also very close to a number of grocery stores should you wish to self-cater, or equally close to a number of very good restaurants. I would highly recommend a stay here during your time in Berlin! I had a great stay at Vannis Haus. The room was very spacious and the bed was comfy however its important to note that it was two separate mattresses combined. The curtains in the room were also not the best at keeping light out. I was also under the impression that the room came with an ensuite however it was a private bathroom, separate from the room. 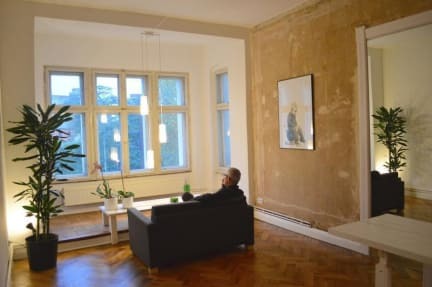 Other than that it was a great location easily accessible to trams and Alexanderplatz station. The house is beautiful and Vanni was super friendly and helpful! Definitely would stay again at Vannis House! Excellent place to stay, had a really lovely time here, in a great location near bars. really helpful owner. Excellent place to stay if you want to scout out Berlin! The location is well connected to public transport, free parking is not far away and near by you have all the facilities (like a bakery and a super market) near by. The place it self is very nice as well, clean and spacious. Also the owner is a very nice and helpful guy. For us it is a no brainer, when we go back to Berlin we want to stay here again, I can recommend it! Beautiful place in a lovely neigthbor. I will visit again for sure. Vannis was very helpful with all mu requests.